✔Fully compatible with IOS and Android smartphones which with bluetooth version 4.0/4.0+. (1)IOS:OS system should be IOS7.1 or above. (2)Android:Os system shoud be Android 4.4 or above. 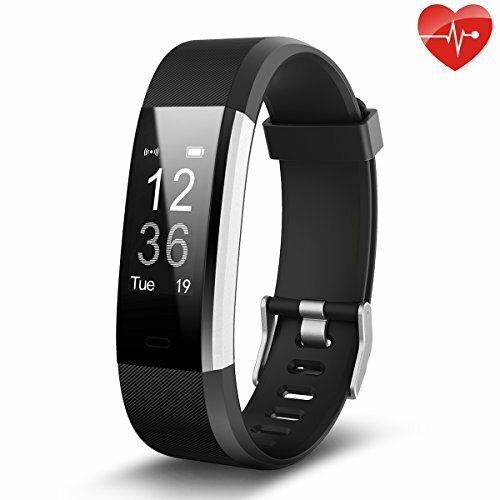 ✔A fitness tracker with 8 sports mode.Which can recording your steps and tracking the distance properly,calculating the consumption of calories by arm swing. ✔A monitor which with basic heart rate and sleep monitor function can show your real time herat rate and sleep state in the app.Sedentary reminder call you stand up for a relaxation. ✔A smart watch that show the time and date, with notification for SMS or call so you can keep up to date at all times.4 dial sets suitable for different occasions. 2.The smart band is IP67 waterproof means it can only for cold shower,washing hand,get wet in the rain.You need to take it off when you taking shower or swimming to prolong the device service life. 3.The wearable pedometer sync data with smart phones in the App via bluetooth. 4.Heart rate results for reference only, please follow your doctor's advice. A:1.Download app from Apple Store or Google Play. 2.Turn phone bluetooth on--open the App--Device--bind device, then search and pair the device with your phone. 3.The band will vibrate once it paired, the time on the band will be auto synchronized. A:1.Check phone bluetooth list, forget all device ever connected. 2. Go to the app--device--unbind device, disconnect it. 3. Then pair it again. All day activity and workout tracking. Data can checked on the touch screen display or App in real time. Personalized Settings: 4 customizable dial sets for different occasions and 8 sport tracking modes can meet your daily needs. Automonitor:Track heart rate, sleep, steps, distance, calories burned,etc automatically. Reminder:Alarm setting,sedentary reminder,message and incoming call notification with gentle vibrating. Built-in USB Design:Charge easily on USB port or PC by poping the host out.No extra charge cable hassle. Working 2-5 days after a fully charge. If you have any questions about this product by Juboury, contact us by completing and submitting the form below. If you are looking for a specif part number, please include it with your message.